On this trip, I’m grabbing extra time in Venice, Florence, and Rome to beef up our restaurant listings for our guidebooks. As things are in constant motion in Europe, it’s important to keep our recommendations both up-to-date and fresh. The big news in Rome is the emergence of the Monti neighborhood as a vibrant place for any visitor to consider. This shot is the central piazza of the zone which stretches (conveniently for travelers) between the Termini train station and the Colosseum. We found several good hotels and a slew of fun eateries of all kinds for the next edition of the guidebook. 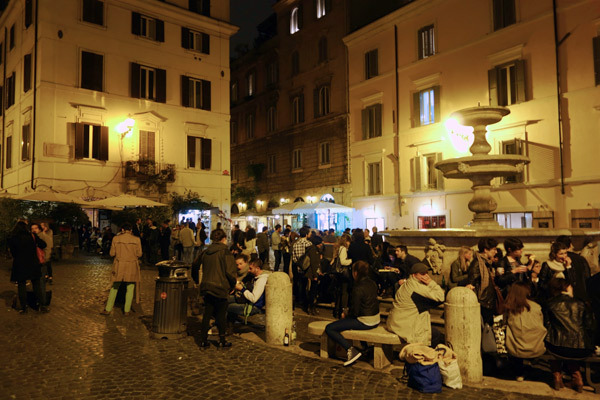 For 20 years I’ve been enthusiastic about the characteristic Trastevere neighborhood as a great place for a colorful dinner. Now, for the energy of a lively neighborhood, I prefer Monti. To be the first traveler on your block to have all my new Monti finds (which will be in the 2015 edition of our Rome guidebook), click here. I was traveling solo in Rome in May. I had a few days to explore before I got on a cruise ship to Amsterdam. My daughter had taken me on a cruise in March to celebrate my 60’s birthday; Chili to Argentina around the Horn exploring patagonia. Loved it had a month off in May so thought I’d try cruising again. I’m a flight attendant and I’m confident in exploring the world on my own. I stayed at an airbnb with a private room in tiburtina a great neighborhood and a short metro ride into colosseo. I wanted to share a great Italian restaurant that I found on Geneva off of Nazionale called Da Trini the food was amazing every mouth full exploded with flavor. I had toasted bread with tomatoes onions olives and gnocchi with a ragu sauce and a class of their house wine. the bill 19 euros and I laid out 30 the waiter asks, “what’s this?” My reply was “may I have change for a tip?” “Put your money away this is not California the 20 is plenty.” Totally cool and I can never figure out how people guess I’m from California. If you ever want to sponsor a travel writer with travel tips on exploring cruise destinations on their own. An alternative to paying a fortune to be in a huge tour group off the ship. I’m your girl!! Did a ton of research on ports before I booked the cruise and had a better time then the tour groups. A few passengers started joining me. I also did airbnb in Amsterdam at the end of my cruise for 6 nights. I loved your walking tours of Amsterdam. And used the IAmsterdam museum card and saw more museums then my host who has lived in Amsterdam all her live. My last night my host invited me to join her and a friend to a food truck fair in the park with 3 stages of live music. An amazing local experience. Hope to try your restaurant suggestions when I return to Rome in September. Was excited to see the horse fair in Jerez Spain, but the ship did not stop in Cadiz as planned and went on to Lisbon I may fly to Sevilla and check it out next year. I don’t think I visited Monti last time I was in Rome. I’ll be sure to check it out next time!